I have read with great pleasure and interest your memoir and find myself at a loss for an appropriate superlative. The cavalcade of humankind that move through the pages and which are so vividly portrayed are memorable as is, I believe, the inherent perspicacity of the narrator who, as a youth aspires to be his own boss. I just wanted to say I really enjoyed your book. Mum said to tell you it was great – it really brought her back to her childhood! Mum was also able to explain to me the different streets you brought us to – and remind me of where I had previously visited. She also said you bought the toffee apples at her Uncle Jack’s (Harold) shop. He also sold bags of rock for half-penny – this was mum’s favourite. Fancy all the O’Neill’s & O’Connor’s all living in Francis street – such a small world compared to today. I really enjoyed reading about your schooling and was amazed at the circumstances of receiving a scholarship for high school and then being ineligible due to when you were born! I also loved your drive and commitment as you started your journey post school (and what it was like applying for jobs back then). 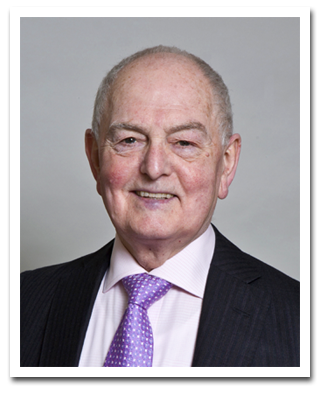 It was a great read – and a credit to you. You should be really pleased with your efforts. Now for my other news ! 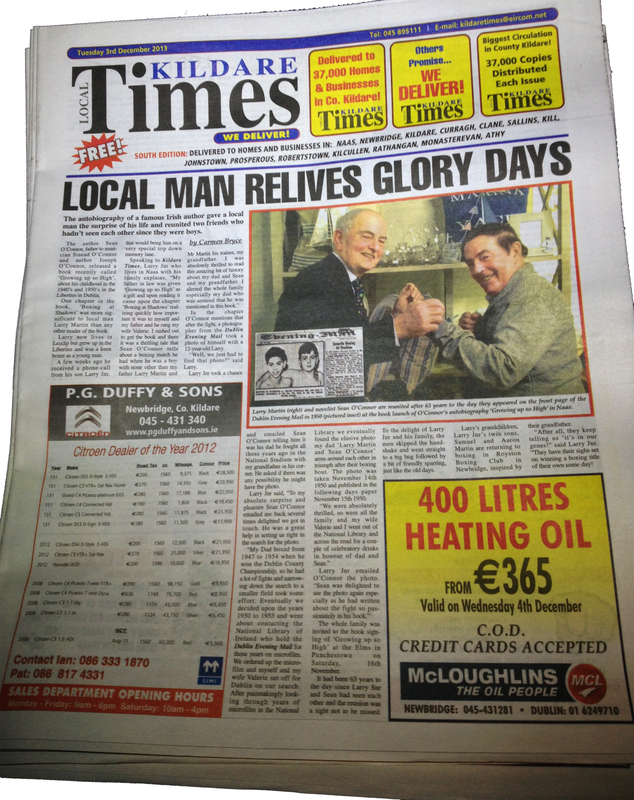 There is a wonderful story with photos of yourself & Larry on the front page of our local paper 'The Kildare Times', it has a weekly distribution of 37,000 copies.We just had to share this amazing story with everyone, I hope you don't mind. I don't know where you live or if you'll get the paper so if there's some place I could post a copy to you please let me know as I'd love you to see it. Thanks again Sean & Best Regards to you and all your family. 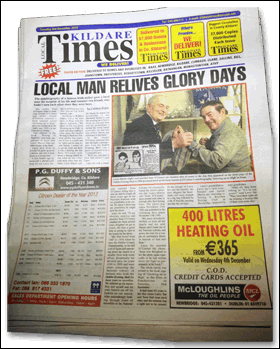 CLICK HERE or on the Kildare Times image to view a larger copy of this article.